We make the best tents in history! We bring the past to life by supplying reproduction tents & supplies for historical re-enactors and collectors. Our dedication to quality and customer service has made Panther the world's largest manufacturer of historical tentage. 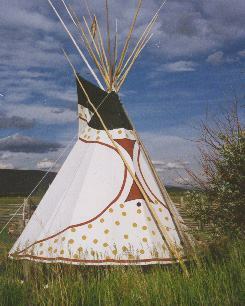 You can choose from colorful Medieval pavilions, Military tentage from the French & Indian War through the American Civil War, the tents of the Fur Trade, and our famous Native American tipis. We also offer you a full line of historical camp gear including clothing, cast iron pots, oak kegs, pottery, beds, tin cook ware, glass beads, pack baskets, tomahawks, flags, stoneware jugs and much more! Catalog number 27 is our current catalog. Our catalog now has 88 pages of Panther tents and historic camping gear in beautiful color. If you would like to order a copy of catalog #27 and receive it in the mail please click here. Online Version: We also have our current catalog (number 27) available online. Download a digital version of our catalog (Adobe Acrobat PDF - 9.4 MB).